Lol. That’s strawberries. But I love the bacon idea! Oh and the brown part is nuts. Pecans. 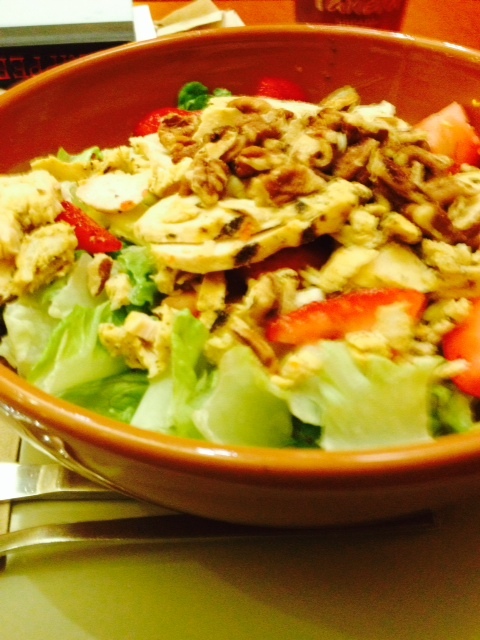 It’s the summer strawberry salad from Panera Bread. Okay got the commercial wrong it for Beggin strips and the dog says “Beggin, Beggin, Beggin” Heyyyyy it’s almost midnight, I’m quitting for the day. Lol. You made me giggle this morning. It is soooo good. Poppy seed dressing and blueberries in it as well. YUM! I should have recognized it as I’ve had it at Panera Bread and loved it. LOL! It was late-AND it does look like bacon. AND isnât it yummy?? I have gotten hooked on chef’s salads, esp with raspberry vinaigrette. I have run out of pomegranate molasses to glaze my chicken breasts,(no one carries it in town), but a little raspberry or apricot jam will do in a pinch…and nuts.Walnuts are good and…I’m going to go eat now! I love raspberry vinaigrette. Yum.